6/10 Cup of Coffee: Almost all of the offense in the Red Sox organization was concentrated at its most southern point. The DSL Red Sox plated 13 men, while the other four teams (including the major league one) totaled only four runs combined. Pawtucket fell in a rain-shortened affair, while Salem and Greenville dropped their contests as well. Pawtucket lost 3-1 to the Louisville Bats (CIN) and a game called by rain in the bottom of the sixth inning. It was a game with an intriguing pitching matchup, as Allen Webster (pictured, right) got the start against rehabbing righty Mat Latos (CIN). Webster scuffled early, allowing a run in the first and two more in the second, but settled in. He retired the last five men he faced, and did not allow a base hit after the third. Overall, Webster gave up three runs on four hits in six frames. He struck out eight, one short of his season high, while walking three. Webster has given up three or fewer earned runs in 13 of his 14 starts so far in 2014. 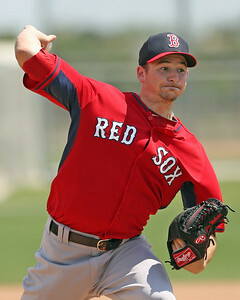 SoxProspects.com Northeast Scout Chaz Fiorino was on-hand at McCoy Stadium, and he reported that Webster sat 93-95 with his fastball and touched 96, while mixing in a slider and changeup. Unfortunately for Webster, the PawSox offense was unable to generate much off of Latos. The only run came in the sixth, when Mike McCoy walked, stole second and third, and came in to score on a Carlos Rivero single. McCoy was the only PawSox batter to reach base multiple times, working a pair of walks. Mookie Betts got his fifth consecutive start in center field. He was 0 for 2 with a walk, and has reached base in all seven games since his promotion to Pawtucket. Salem was also unable to get much going offensively, falling 3-1 to the Frederick Keys (BAL). The Sox had only five hits on the night while falling for the 11th time in their last 14 games. Mario Martinez was 2 for 4 with a double, driving in the lone run. Reed Gragnani walked three times but was 0 for 1, dropping his league-leading batting average two points to .337. The bright spot for Salem came on the mound, where William Cuevas had his strongest outing of the season. The 23-year-old Venezuelan righty tossed a season-high seven innings. He allowed two runs (one earned) on only four hits, striking out three and walking one. He took the tough-luck loss, falling to 2-6 on the year. Madison Younginer gave up a run on two hits in his inning of relief. Greenville dropped its series opener with the Charleston RiverDogs (NYY), losing 6-2 to their Palmetto State rivals. Trey Ball had an uneven start for the Drive, giving up five runs on seven hits in 5 1/3 innings. He struggled with his control early, walking two in the first. While he was able to find the strike zone more consistently from then forward, he often got too much of the plate when he did so, giving up solo homers in the fourth and sixth. Jacob Dahlstrand had a solid outing in relief, giving up just an unearned run in 3 2/3 innings, striking out three without issuing a walk. Zach Kapstein was the only player with multiple hits for Greenville, as the left fielder was 2 for 4 in his first game since being activated from the disabled list. Wendell Rijo was 1 for 3 with a walk and has built a modest four-game hitting streak. After slumping for much of May, Rijo is off to a good start in June, hitting .333/.393/.500 through his first seven games. The DSL Red Sox pounded out 14 hits in their 13-1 romp over the DSL Orioles2. As has been the case often in the early season, Rafael Devers (pictured, left) and Roldani Baldwin were at the center of the attack. Devers reached base three times, going 1 for 3 with a pair of walks, scoring two and driving in one. He has hit safely in all eight games, and has been on base at least twice in seven of those contests, giving him an absurd .467/.564/.800 slash line. Baldwin had a 3-for-5 day, including a double, an RBI, and two runs scored, raising his average to .389. Luis Alejandro Basabe tripled, scored three times, and drove in three while going 2 for 5. Samuel Miranda was also 3 for 5 for the Sox. The offensive outburst made life easy on the pitchers' mound. Enmanuel De Jesus got the win, allowing a run on three hits in five innings. De Jesus struck out four and walked two. Algenis Martinez was excellent out of the bullpen, giving up just one hit in three shutout frames, striking out four without issuing a walk. Darwinzon Hernandez pitched a scoreless ninth to close out the win for the Sox. 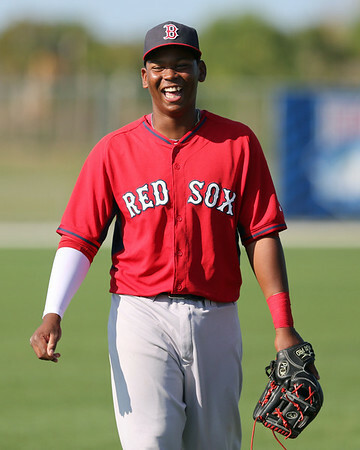 Player of the Day: While he's been overshadowed some by the fantastic start by Rafael Devers, Roldani Baldwin continues to play a key role in the DSL lineup. That continued on Monday, as Baldwin was 3 for 5 with a double to lead the rout. The catcher has driven in 11 runs in eight games, going 14 for 36. Baldwin was signed in November out of the Dominican Republic by scout Manny Nanita.